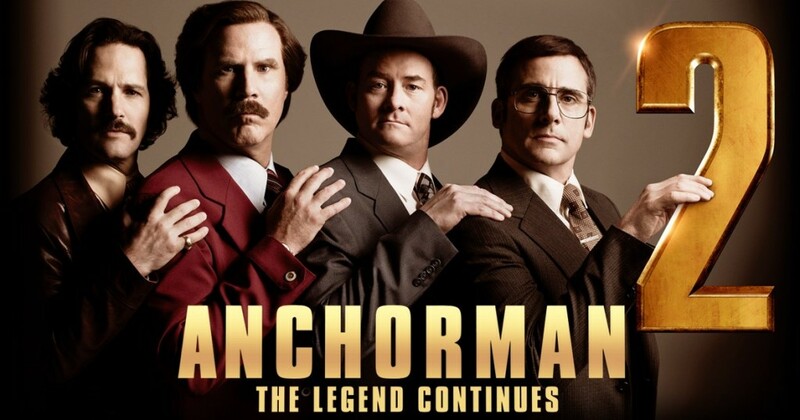 So the new trailer for Anchorman 2: The Legend Continues just dropped. It. Looks. HILARIOUS!!! Holy crow, people this is going to be a great movie! We’ve got the same crazy crew led by Will Ferrell. I am a huge fan of his, anyway, and this one does not seem like it will disappoint. After reading some of the comments from the slack-jawed, fly-catching public and I don’t see how people are complaining that it doesn’t look funny or that they ALREADY hate it? Puh-lease. Either you’re a Will Ferrell fan or you’re not. If you’re not, chances are good you’re not going to like anything he’s in. I mean at one point in the 2 minute 37 second teaser, Steve Carell is wearing a giant dog cone! I suppose it’s to keep him from chewing on his stitches. I love how the marketing has included Ron Burgundy doing car commercials and happily pimping the new Ben and Jerry’s ice cream “Scotchy Scotch Scotch”. I’m hoping the best hasn’t been given away because I laughed like The Joker thinking he just cornered Batman. This entry was posted on Thursday, October 24th, 2013 at 10:13 am	and is filed under Film, News. You can follow any responses to this entry through the RSS 2.0 feed. You can skip to the end and leave a response. Pinging is currently not allowed. « The Weinstein’s Pick Up ‘Macbeth’ With Michael Fassbender And Marion Cotillard! !